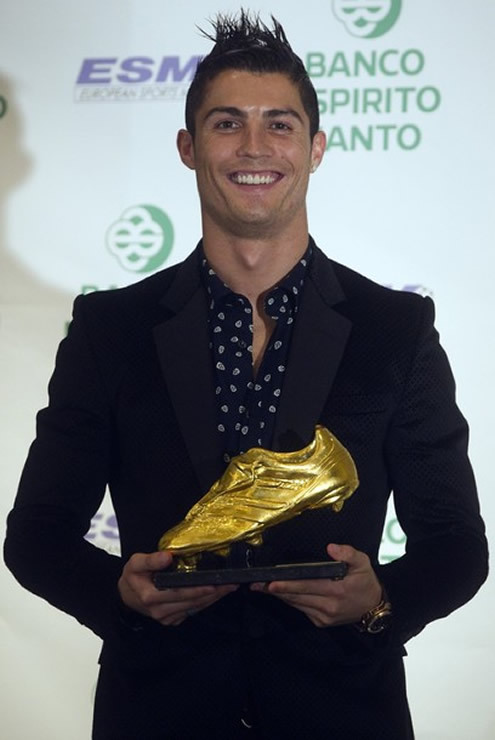 This Friday, Cristiano Ronaldo received the European Golden Shoe award, for his 2010-2011 campaign, after having scored a total of 40 (41) goals in the Spanish League, "La Liga". It's the 2nd time Ronaldo receives this trophy, since he had already won it in 2008, while still playing for Manchester United. 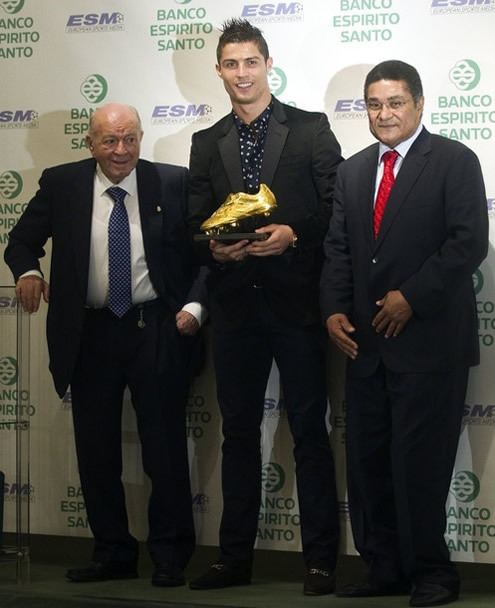 After breaking "La Liga" goalscoring record in 2010-2011, with 40 (41) goals, this Friday Cristiano Ronaldo received the European Golden Shoe trophy 2011, which awards the highest goalscorer in all the European leagues. 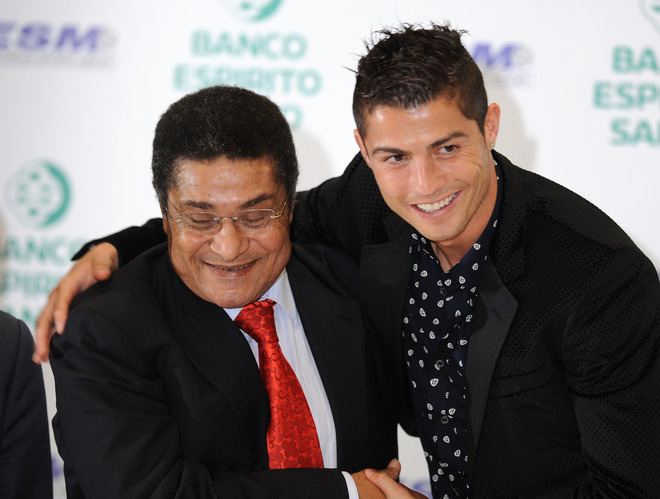 The ceremony was held in Madrid and several personalities didn't lose the chance to be present, such as Di Stéfano, Eusébio, Florentino Pérez or Zinedine Zidane. After having won this same trophy in Manchester United in 2008, Ronaldo repeated the achievement last season, but he has also shown that he keeps his feet on the ground and by keeping focused at winning the collective titles. Cristiano Ronaldo is now playing his 3rd season for Real Madrid, but so far, the club has only won 1 trophy, the Copa del Rey. Individually, Ronaldo has been impressive in last season's campaign, scoring 40 (41) goals in La Liga, 7 goals in the Spanish Cup and 6 goals in the UEFA Champions League (Total: 53-54 goals). This European Golden Shoe trophy awards the highest goalscorer in all the European Leagues and Cristiano Ronaldo didn't give a chance to his direct competition, leaving Lionel Messi behind (33 goals), 7 goals away from his new goalscoring record. A few football fans may still confuse the European Golden Shoe award with FIFA's Ballon d'Or (Golden Ball), but there's no reason for that to happen. The European Golden Shoe handed to Ronaldo this Friday, is an objective award on which the winner is decided exclusively on the ammount of goals scored criteria. 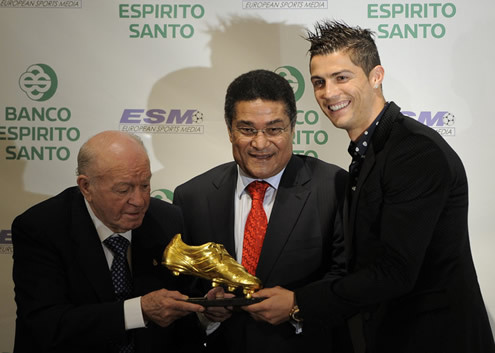 Since no one else in Europe scored more goals than Cristiano Ronaldo in 2010-2011, the Portuguese player was given the right to receive this trophy. In the other hand, the FIFA Balon d'Or is a subjective award. The winner will be announced in the 9th of January of 2012, in a decision based on votes casted by all the National Teams coaches world-wide. For that reason, there's always some controverse surrounding the fairness of this trophy and even Cristiano Ronaldo made a remark on that fact, during this European Golden Shoe press-conference and ceremony. The winner of FIFA Balon d'Or is proclaimed as FIFA's Best Player in the World. You can read a more complete report, including Cristiano Ronaldo statements, videos and more pictures from this European Golden Shoe award event, in a news article that will be posted later today. Real Madrid next game is against Osasuna this Sunday, for La Liga. You may watch Real Madrid vs Osasuna, in our Soccer Live Streams section, but please note that this match will be played at a very unusual hour (11:00 GMT+0). The countdown clock timer, displaying the time left for the next Ronaldo game, is shown on the top right corner of all pages. Besides that game, you can also watch Manchester United vs Sunderland live and QPR vs Manchester City this Saturday. All streamings are provided from our "Live" section.